All of their jerky is made from inside rounds of American-raised beef, marinated for 24 hours in Robey's own homemade recipes. It's processed and packed in the company's own facility. Robey goes on to say that their state-of-the-art smokehouses record the internal temperature of the meat to ensure critical control temperature is reached prior to drying the meat. He runs water activity tests to ensure the jerky will be shelf-stable for one year. Fatman's uses no additional preservatives, aside from what's already in the seasonings. Beef, water, soy sauce, red chile puree, lemon juice, garlic salt, tabasco sauce, salt, black pepper, red pepper flakes. A combination of the natural meat flavors and the red chile is what I taste initially from the surface of these pieces. I can also pick up a bit of the salt, and maybe a hint of the soy sauce. Moving into the chew, I'm mostly getting the natural meat flavors. Being advertised as a "Red Chile" variety, one assumes this is hot. And it is, though not blazing hot. I'd rate this as "medium". After several pieces, it builds up on my tongue and develops a moderate burn. The taste of red chile (aside from the hot kick) is evident as well, but mostly on the surface. I don't taste much of it in the chew. The natural meat flavors seems to be dominant taste in this jerky, providing a strong flavor. I can get its taste from both the surface of these pieces and during the chewing. It's mostly during the chewing that I taste it the most. It's a taste that reminds me of the center portion of a prime rib steak. And considering this jerky contains no added preservatives, it still retains a fresh tasting meat flavor. The other seasonings mentioned in the ingredients list, lemon juice, black pepper, garlic salt, are not really noticeable on their own. I can maybe detect the garlic as an aftertaste. The saltiness in this is light. It's mostly in the chew that it becomes noticed and doesn't overpower the natural meat flavors or the red chile. Overall, this is a great tasting jerky that emphasizes the natural meat flavors pretty well. The red chile seasoning seems to be in just the right amount to give you the taste of red chile but not scald your mouth so much as to make this difficult to eat. There's also a simplicity in this jerky, which I think is caused by its lack of sugar. It gives you the sense that this is just meat doused with red chile. 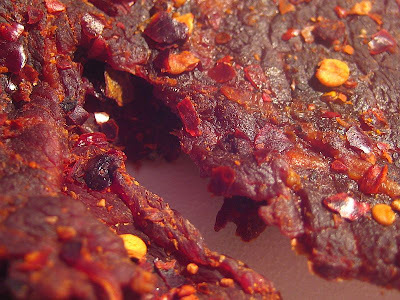 This is largely a thin dry jerky, with a small amount of crunchiness to it, which may appeal to many snackers, even those who don't eat a lot of jerky. It's very easy to tear apart, and easy to eat. I found some small streaks of fat on a couple of pieces, but that was all. I think it actually enhanced the flavor a bit. Otherwise, I found no tendon or gristle or anything else chewy. For general jerky snacking purposes, it has a decent value. It offers a great taste and great meat consistency, and it does provide plenty of snackability. It's just that the higher price per ounce makes it hard to justify if you want to snack on some jerky. As a Red Chile variety, it offers a better value because it does give out a good taste of red chile pepper along with a moderate amount of red chile burn. But if you're someone who gets "high" off the endorphins generated from really hot foods, you won't get much endorphins from this. But on its own merits, it's a great jerky. If you're a jerky lover like me and you want to experience the best the jerky world has to offer, this is one you'll need to try. I'm giving this one a best rating. This red chile variety from Fatman's gives out a good taste of red chile pepper combined with a great natural meat flavor. It'll burn your palate just enough to let you enjoy its peppery goodness but not so much that it won't have you reaching for a drink every few seconds. The slight amount of crunchiness that results from the thinly sliced pieces actually adds to the snackability and gives off an added dimension of enjoyment. Eating this, I get the sense of "gourmet jerky", with it's strong meat flavor, ease of eating, and the liberal dosing of red chile pepper. It has a certain simplicity to it that will appeal to folks who are tired of brands that load up their jerky with sugar and tenderizers. Beer recommendation: Try a porter. I love fatman's beef jerky. Best their is, I was in the beef jerky busines for 10 years. I have tryed alot of jerky in my days, and fatman's take the cake! I love the Green and Red chile the most, but all the other favors are great too. Fatmans has a good thing going with their non-commercial tasting beef jerky. Im sure you will Fatmans beef jerky it in a store near you, real soon!!!! i love this jerky. 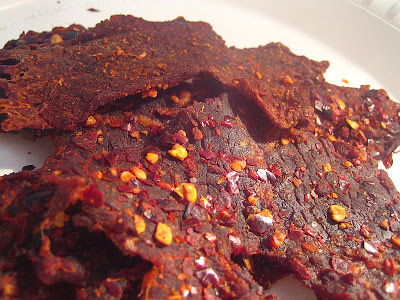 do you have any other recommendations of a thin, dry, semi crispy jerkys? i havent found anything else even close to this.